The first episode of the revived X-Files was shown to packed house at New York Comic Con. Here are our spoiler-free first impressions. If there was one really big takeaway from the first episode, it was just how much of the old show had survived. Despite everything, for better or worse, this is The X-Files, old flaws (a lot of complicated mythology), old strengths (the characters and their chemistry) and all. Despite having only a six-episode run, the revival is not a single, standalone story. Chris Carter told the crowd that the premiere is the first part of a two-part story. But we won’t see the second part of that story until the sixth and final episode. Episodes one and six will be mythology episodes, with two through four being standalones. Episode one leans hard on the show’s decade-long mythology, rewarding fans in a way that was very satisfying. Because of that, there is a lot of exposition in the first episode in order to make it accessible to new fans. David Duchovny and newcomer Joel McHale talk a lot in order to get a metric ton of conspiracy theory history—both real and show-invented—to the audience. Not every little bit of the mytharc is here, however. Chris Carter has clearly spent a lot of time thinking about the way the show ended and cherry picking some of the most niggling and emotionally-charged bits to bring forward. It’s a good instinct. Whether or not you agree with the things Carter’s chosen to pursue is going to be a matter of personal taste. Mulder is always Mulder, down to the soul-deep “Mulder, no!” reaction he elicits. Scully is Scully, skeptical until there’s proof. Their arguments are intense, and clearly weighed down by history. The best thing about the episode was that it approaches conspiracy theories themselves as an X-File. Mulder may have met his match in McHales’ Tad O’Malley, a conservative webshow host who may or may not believe everything he says. He’s a slick counterpart to Mulder, benefiting off of his rants where Mulder constantly and consistently lost out. Scully’s skepticism isn’t just about the science; it’s now about Mulder and the effect that sharing wild speculation and paranoia could have on the world. Despite the conspiracies being as huge as ever, the whole episode felt very, very personal to Mulder and Scully. The other new stuff is cosmetic and contextual. It looks slicker and the effects are better than before. 9/11, the PATRIOT Act, and FEMA all get named-checked. It’s a declaration that the show’s “trust no one” tagline is as relevant now—possibly more relevant—than it was in the ‘90s. When the main titles—showing Duchovny, Gillian Anderson, and Mitch Pileggi’s orignal FBI badges—played, I’ll admit to tearing up a little. The episode was uneven in many ways, with a lot of talk and very little action, but it did its job. 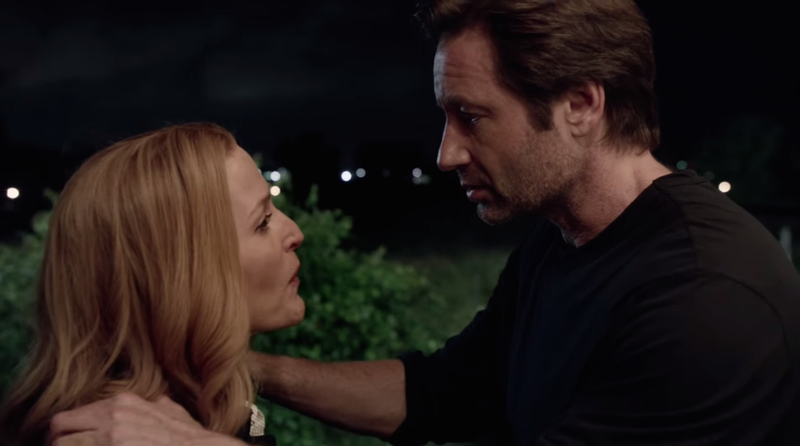 It made a 2016 X-Files feel like an honest continuation rather than a cynical cash grab.